Managing stormwater runoff is a significant challenge for municipal water entities. Large areas of impermeable concrete inhibit the absorption of stormwater into the ground, causing water to pool and increasing the potential for flodding. 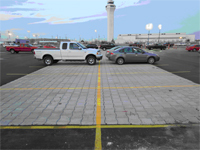 Permeable blocks provide a solution to that problem by allowing water to flow under the surface. The articulated and arched design of PaveDrain bricks allow water to filter into rock bedding beneath them and eventually back into the water table. November/December 2015 - Developers have been conditioned to compromise on projects in order to set aside room for storm water management facilities. The engineering community has become adept at squeezing in networks of pipe and ponds to comply with federal, state and local storm water regulations. This mindset is costing developers millions of dollars for the purchase of land for storm water facilities (2 to 3 acres) and in lost revenue that could have been generated by selling and leasing more space or from having smaller production space. Municipalities may achieve storm water objectives by requiring developments to construct storm water ponds, but lose significant tax dollars on storm water facilities that have little value or are non-taxable. 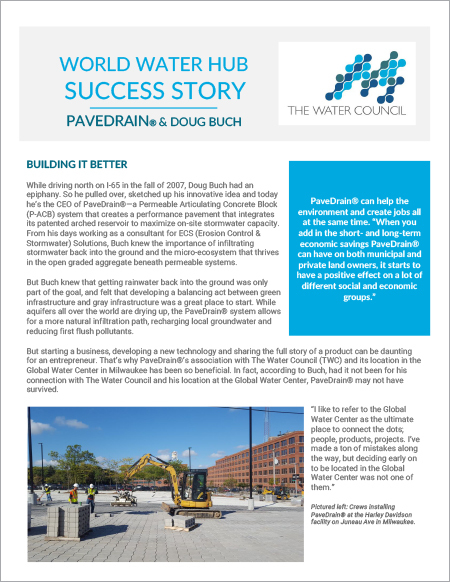 Davenport, Iowa - Just under 16,000 square feet of the PaveDrain system was installed this past fall by a local utilities contractor for the reconstruction of Dover Court in Davenport, Iowa. The PaveDrain system and underlying geosynthetic base stabilization was distributed by Quick Supply Company out of Des Moines, Iowa and manufactured in nearby Eldridge, Iowa by regional block manufacturer King's Materials. Additional projects utilizing the PaveDrain system are planned by the City of Davenport in the near future. 2013 Ford Escapes driving over a section of PaveDrain almost everyday! MARCH 19, 2013 - PaveDrain, LLC announced as winner of the Early Revenue Track of the 2012 Imagine H2O Consumer Innovations Business Plan Contest. Ford Motor Company has a long, distinguished history of innovative solutions in the automobile industry. Their use of a new permeable performance pavement for their Louisville production facility continues this innovative tradition. The PaveDrain System was chosen as a sustainable stormwater solution for their 1 billion dollar plant renovation for the all new, re-designed 2012 Ford Escape.